This blog breaks down all four double header of games played in the East Region, which are the games that appear in the upper left corner of brackets. It shows the top 10 players on the floor for each of these double headers, and gives details on which factors give advantages to which teams. Hot: Nova coming off Big East title, Wisconsin dropped from 10th to 23rd since early February. 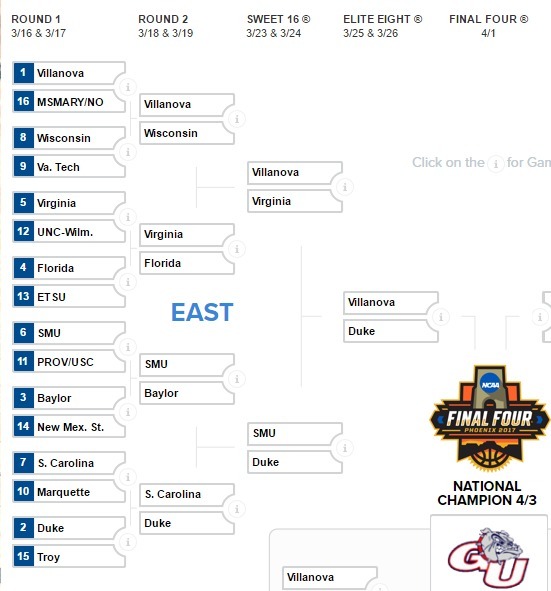 “Home” Advantage: Getting to Buffalo through the snow easiest for Villanova, hardest for New Orleans if they survive. Possible “style/home” edge upset: Virginia Tech has best style chance at upset as the 9th best 3-point shooting team against a Villanova team that is only 300th in forcing teams to shoot a 2-pointer instead of a 3-pointer. Villanova only 81st best at protecting the ball, which would give Wisconsin (41st at steals) a much better shot at upset than Virginia Tech (347th of 351). 248, TJ Cromer #0, East Tennessee St.
Possible “style/home” edge upset: Florida does not allow teams to get off three-pointers and has the big home advantage in their state, hurting East Tennessee State (44th in 3-pointers). Scott Drew continues to guide Baylor. Baylor has slid a little from 7th in the final weeks, while SMU is the hottest team in the league with only a 2-point loss at Cincinnati preventing them from finishing 26-0. USC’s Andy Enfield proved himself with the Sweet 16 run at Florida Gulf Coast, has a former Maxim cover wife, beautiful children, millions of dollars, and an up and coming program – but with one of the youngest teams in the country some are questioning if they were quite ready for a bid. Then again, that’s what they said about Syracuse last year and VCU several years ago before both made the Final Four. Healthy: New Mexico State is better with Sidy N'dir playing. Possible “style/home” edge upset: Baylor and SMU both sites close to home in the openers to try to get to each other in the 2nd round. Healthy: Duke and South Carolina rank even higher with Thornwell and Tatum out – and Marquette could drop if Fischer (shoulder) cannot play Thursday. Not only is South Carolina’s Sindarius Thornwell the No. 1 ranked player in the country at www.valueaddbasketball.com, but he would have rated even higher if had not missed six games. Marquette’s team is No. 1 in the nation in 3-pointers, and Markus Howard would break the all-time record of 56% if he hit 7 of 9 this weekend – a tough task against two of the toughest defenses in the country to get 3-pointers off against. Unfortunately for whoever wins between South Carolina and Marquette, Duke is next up with four players who would be in the top 100 if Grayson Allen had not lost his cool and Tatum had played the whole season. Possible “style/home” edge upset: Big South Carolina style edge as they are 21st in steals, and Marquette is terrible (224th) in protecting the ball, which could be a huge edge in light of the virtual home crowd for South Carolina. Marquette relies on being 1st in the country in 3-point shooting, but South Carolina’s suffocating defense is 87th best at forcing opponents to shoot 2-pointers, meaning Marquette must hope Luke Fischer can play through an injured shoulder to get an inside game. Duke absolutely denies the 3-pointers (7th best in forcing 2-pointers), should Marquette get through.